Here we find an even more severe overgrowth of K. oxytoca. Note that the assay is able to keep on counting target genomes over many orders of magnitude. Here the oxytoca is present at 1.48 x 109 /gm, and this child also shows concurrent extremely high levels of Rhodotorula sp. Incidence of Rhodotorula in our results is higher that from culture techniques, probably because it is identified microscopically, but grows poorly in usual culture media. 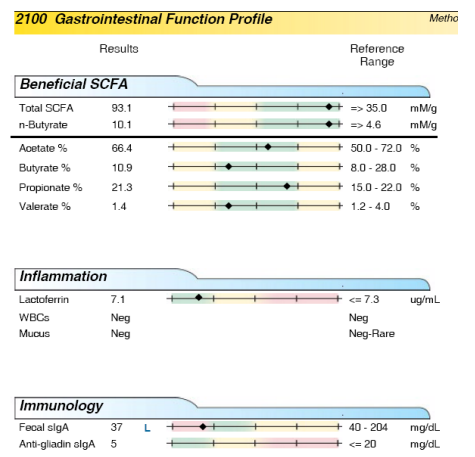 Plenty of metabolic activity is shown by the abundant SCFA and balanced percentages. Note the normal level of Lactoferrin, showing lack of inflammatory involvement currently in this patient with very active IBS due to profound microbial overgrowth. The immune barrier is weakened as shown by low sIgA. Poor mood, poor sleep, possible anxiety secondary to dysbiosis-related failure of tryptophan to be synthesized to serotonin and serotonin to melatonin. 80-95% of serotonin are produced in the gut. Dysbiosis affects gut conversion of tyrosine to dopamine. And replenishment and repopulation of SBO commensals/fermented foods, basically the 7-Steps to cure intestinal permeability and SIBO/SIFO, small intestine bacterial and fungal overgrowth. How does this occur? After a round of gastroenteritis or antibiotics, the commensal organisms and fungi that safeguard our gut domain are reduced in number. The pathogenic strains emerge without these. Soon yeasts, fungi and aggressive bacterial take root in places that are normally kept clear. The small intestines are a frail target -- only one cell layer thick. Full of moisture, oxygen, intermittently constant food, and a rich blood supply. Once fungi or bacterial take hold, food can no longer be digested well. The GI barrier becomes broken down. For the host, bloating or brain fog are frequent symptoms. (c) Severe (failure to thrive, weight loss, weight gain, rashes, mood swings, infertility, migraines, bloody stools, bipolar, psychiatric disorders, alcoholism, cancer, autoimmune diseases, T1DM, celiac, rheumatoid arthritis). In autism and other spectrum conditions, the gut-brain axis is broken. In many cases, autism is reversed once the gut is fixed and no longer spilling out undigested food particles (gluten, casein) which resemble body proteins and other proteins of microbial origins. In this case, like many spectrum cases, both bacterial and fungal overgrowths are present and the absent of commensals such as Clostridia. The problem in this C-IBS (constipation dominant IBS) case is not insufficient butyrate, but actually food fermenting excessively in the small intestines by 'regular/good' bacteria in the inappropriate place. Once a commensal grows aggressively, it can switch to a pathobiont status, exploring and invading an ecological niche. One of the benefits of the 7-Steps to cure SIBO/SIFO that it is aligned to our ancestral heritage and tight association with the soil and abundant earth. The earth not only feeds us with crops and herds but is the 'horticulture' that also provide wonderful organisms that serve to maintain the 'lawn of our gut' by weeding, weeding and weeding [hat tip: Brent Pottenger and here is his stellar gut GDX GI FX testing]. I’d like to add a success story here. Last August, just a week after starting graduate school, I came down with an intense bout of IBS-D (to keep it clean). Not unusual, as I’ve had the flu before. But this ‘flu’ did not stop, and stranger things began to happen. I developed tinnitus, neuropathy, dizziness, fatigue, muscle twitches and my sleep was terrible. 6 weeks later, I had lost 25 pounds (that I didn’t need to lose) and I was barely able to get out of bed. A colonoscopy, endoscopy, stool examination, countless blood tests and specialists later and still no answers. I took a medical leave from my program, and had to return to my home in California because I was no longer able to take care of myself. It was around this time that I began experimenting with SCD and GAPS style diets. They did prove to help with some symptoms, but not all, and not with much speed. In fact, I would say that I got worse on these diets, as my sleep became a struggle, and that set everything back. Supplements like Vitamin C, Colostrum and DGL helped but were definitely not the answer, either. It was late December, and I had to make the call whether or not I was going back to school. I decided to go back out of desperation for wanting to be better, without really having made any progress. Not a wise decision, but I got lucky. It was just two weeks ago, just at the start of the semester, that I began to follow the advice of Dr. BG over at Animal Pharm blog on correcting SIBO, as well as the advice here about resistant starch. I am so, so glad to say that I am 90% back to normal. My tinnitus is almost gone, my muscle twitching is nearly gone, my sleep is incredibly better. I can finally go back to teaching and researching without fears of passing out in the middle of class. The two biggest factors in my success was the inclusion of properly prepared starches (in Perfect Health Diet amounts) and supplementing with potato starch and psyllium husk twice a day. I can’t speak for all the other successes and failures when it comes to variable carb intakes, potato starch supplementation and general paleo-style eating, but it worked for me. So thank you Tim, Rich, Grace and everyone else who’s been posting about this stuff. I’m not shitting you (har har) when I say that you saved my young life. Have you had success with the 7-Steps? Are you seeing improvements and optimization of gut/brain/muscle/genitalia?? By the spring of 1862, a year into the American Civil War, Major General Ulysses S. Grant had pushed deep into Confederate territory along the Tennessee River. In early April, he was camped at Pittsburg Landing, near Shiloh, Tennessee, waiting for Maj. Gen. Don Carlos Buell’s army to meet up with him. On the morning of April 6, Confederate troops based out of nearby Corinth, Mississippi, launched a surprise offensive against Grant’s troops, hoping to defeat them before the second army arrived. Grant’s men, augmented by the first arrivals from the Ohio, managed to hold some ground, though, and establish a battle line anchored with artillery. Fighting continued until after dark, and by the next morning, the full force of the Ohio had arrived and the Union outnumbered the Confederates by more than 10,000. The Union troops began forcing the Confederates back, and while a counterattack stopped their advance it did not break their line. Eventually, the Southern commanders realized they could not win and fell back to Corinth until another offensive in August (for a more detailed explanation of the battle, see this animated history). 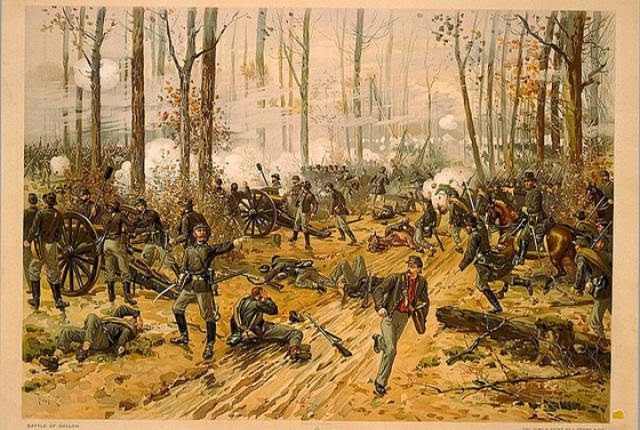 All told, the fighting at the Battle of Shiloh left more than 16,000 soldiers wounded and more 3,000 dead, and neither federal or Confederate medics were prepared for the carnage. The bullet and bayonet wounds were bad enough on their own, but soldiers of the era were also prone to infections. Wounds contaminated by shrapnel or dirt became warm, moist refuges for bacteria, which could feast on a buffet of damaged tissue. After months marching and eating field rations on the battlefront, many soldiers’ immune systems were weakened and couldn’t fight off infection on their own. Even the army doctors couldn’t do much; microorganisms weren’t well understood and the germ theory of disease and antibiotics were still a few years away. Many soldiers died from infections that modern medicine would be able to nip in the bud. In 2001, almost one hundred and forty years after the battle, seventeen-year-old Bill Martin was visiting the Shiloh battlefield with his family. When he heard about the glowing wounds, he asked his mom - a microbiologist at the USDA Agricultural Research Service who had studied luminescent bacteria that lived in soil - about it. And that’s just what Bill did. He and his friend, Jon Curtis, did some research on both the bacteria and the conditions during the Battle of Shiloh. They learned that Photorhabdus luminescens, the bacteria that Bill’s mom studied and the one he thought might have something to do with the glowing wounds, live in the guts of parasitic worms called nematodes, and the two share a strange lifecycle. Nematodes hunt down insect larvae in the soil or on plant surfaces, burrow into their bodies, and take up residence in their blood vessels. There, they puke up the P. luminescens bacteria living inside them. Upon their release, the bacteria, which are bioluminescent and glow a soft blue, begin producing a number of chemicals that kill the insect host and suppress and kill all the other microorganisms already inside it. This leaves P. luminescens and their nematode partner to feed, grow and multiply without interruptions. As the worms and the bacteria eat and eat and the insect corpse is more or less hollowed out, the nematode eats the bacteria. This isn’t a double cross, but part of the move to greener pastures. The bacteria re-colonize the nematode’s guts so they can hitch a ride as it bursts forth from the corpse in search of a new host. The next meal shouldn’t be hard to find either, since P. luminescens already sent them an invitation to the party. Just before they got got back in their nematode taxi, P. luminescens were at critical mass in the insect corpse, and scientists think that that many glowing bacteria attract other insects to the body and make the nematode’s transition to a new host much easier. Looking at historical records of the battle, Bill and Jon figured out that the weather and soil conditions were right for both P. luminescens and their nematode partners. Their lab experiments with the bacteria, however, showed that they couldn’t live at human body temperature, making the soldiers’ wounds an inhospitable environment. Then they realized what some country music fans already knew: Tennessee in the spring is green and cool. Nighttime temperatures in early April would have been low enough for the soldiers who were out there in the rain for two days to get hypothermia, lowering their body temperature and giving P. luminescens a good home. Based on the evidence for P. luminescens’s presence at Shiloh and the reports of the strange glow, the boys concluded that the bacteria, along with the nematodes, got into the soldiers’ wounds from the soil. This not only turned their wounds into night lights, but may have saved their lives. The chemical cocktail that P. luminescens uses to clear out its competition probably helped kill off other pathogens that might have infected the soldiers’ wounds. Since neither P. luminescens nor its associated nematode species are very infectious to humans, they would have soon been cleaned out by the immune system themselves (which is not to say you should be self-medicating with bacteria; P. luminescens infections can occur, and can result in some nasty ulcers). The soldiers shouldn’t have been thanking the angels so much as the microorganisms. As for Bill and Jon, their study earned them first place in team competition at the 2001 Intel International Science and Engineering Fair. 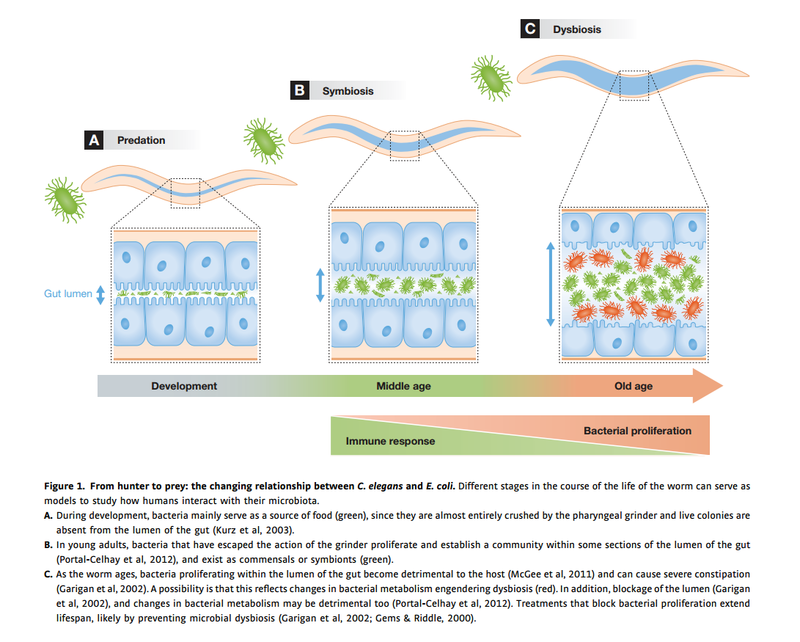 Worms need microbes too: microbiota, health and aging in Caenorhabditis elegans. EMBO Mol Med. 2013 Sep;5(9):1300-10. Humans are one of the highest form of eukaryotes and worms, the simplest, most elegant. C. elegans nematodes have nearly the full suite of homolog nuclear receptors, IGF, insulin, and AMPK pathways. They have a gut microbiota as well and mutualistic health of the microbiota mirrors their longevity. 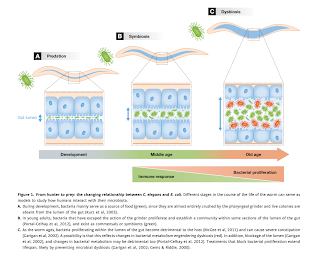 Careiro and Gems discuss in the above article how bacterial proliferation of the nematode gut highly correlates with reduced immunity and aging. While the relationship is mutualistic, both microbes and host benefit. The microbes have a happy home, warmth and food. For the worm host, the gains are immeasurable -- happy immunity, vitamins/minerals and longevity. One of the best growth media for C elegans is B subtilis, the soil based organism I talk a lot about. When growth media are switched out to bacteria which are less mutualistic (like pure E. coli), the nematodes have a very short life. Blockages of the lumen occur; worm constipation and something analogous to mammalian SIFO/SIBO. When the media has a natural SBO like B subtilis, the nematodes thrive, have no signs of aging or bacterial proliferation and demonstrate notable worm longevity. Any intervention in fact that prevents bacterial proliferation (SIFO/SIBO) extends lifespans they reveal. Makes sense, no? Two of my favorite probiotics contain B subtilis (Prescript Assist and AMD Syntol). Foods that contain B subtilis include any ancestrally prepared and fermented foods that include both protein and starch: gochujang, natto, fermented black bean sauce, Thai shrimp sauces, etc. Gut microbiota as a candidate for lifespan extension: an ecological/evolutionary perspective targeted on living organisms as metaorganisms.Ottaviani E, Ventura N, Mandrioli M, Candela M, Franchini A, Franceschi C.
The second article discusses how in the Neolithic only 10,000 years ago, humans were faced with even more pathogens than ever by living in close quarters with both other humans and livestock. Without a resilient immune system and evolving gene polymorphisms, we could not have survived. "With the introduction of agriculture and animal husbandry, food resources became more abundant and constant and, for the ﬁrst time in human history, the population size dramatically increased." 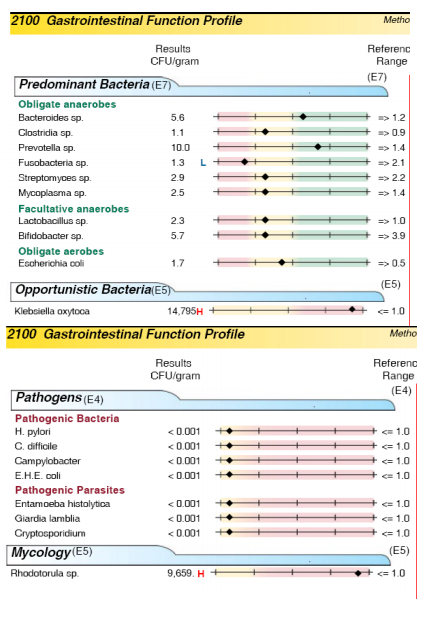 The authors theorize that if it were not for improved immunity via the gut microbiota humans would not have been able to the endure the high antigenic and pathogen load. I think this is true. The lectins and phytates from dietary sources were one challenge and the pathogens like worms, malaria, plague, mites, and other fun things were yet another hurdle. Hemochromatosis, cystic fibrosis, increased salivary alpha-amylases might have been some of the adaptations that survived. "Furthermore, symbiont intestinal microorganisms provided a strategic ﬁtness advantage for the human beings living the Neolithic agricultural revolution by protecting the host from pathogen colonization and enhancing the plasticity of the immune system. Finally, dietary change in the Neolithic agricultural societies due to agricultural practice likely induced a substantial re-adaptation of GM [gut microbiota], favouring microbial communities capable to ferment these new complex polysaccharides to short chain fatty acids (Hehemann et al. 2010)." Who are your symbionts? Are they extinct? Do you respect them? Are you doing things that favor their growth? Have you weeded? Seeded your gut microbiota? Feeding and breeding your symbionts in luxury and abundance? I'm grateful for Tim and Richard at FTA for starting the conversations on gut ecosystems, fiber and health optimization. Thanks for directing people over here to the 7-Steps To Cure SIBO/SIFO. Happy New Year to my kind readers~!! Thank you for sharing your wonderful stories. I love U and love hearing them all. Anonymous was taking 3 months of PS but no changes until SBO probiotics were taken. In only 3 weeks with taking Primal Defense and Prescript Assist three times per day, she reported her autoimmune Sjogren's disease to be completely 100% 'cured'. Three noxious auto-antibodies (SSB-LA, Chromatin, ANA) normalized or returned to near normal. "My fingernails are clear and my cold fingers are gone. Oh, I didn't want to tell you this just yet. But my Sjogren's antibody (SSB-LA) turned negative last week! That's after being on the RS/Probiotics regimen for only 3 weeks! I was on RS since August, however. Also, one of the incipient lupus antibody that I tested positive (Chromatin) turned negative this time! My ANA is positive but with very low titer (1:40). That's the lowest I ever tested and even normal people test at that level. My rheumatologist will be confused! If this holds up, and I'm hoping it does, I have cured an autoimmune disease. No symptoms and no antibody: that's a 100% cure. Not just remission. Being antibody-negative is not supposed to be possible, right? Whither molecular mimicry and eternal damnation, I mean, eternal autoimmune tissue attack? You mean, that's contolled by the microbiome, too? So much for Dr. Fassano and leaky gut (which I now realize seem to have been a foil ... it happens but the underlying condition seems to be gut dysbiosis and bacteria). Wow, I gotta try this on my aunt who also has Sjogren's and my cousin who has Lupus. Thanks so much guys. This is not what modern medicine says is possible!" "Just thought I’d add to the noise here- I’ve had a set of health problems that differs from most people using RS on this site, namely persistent and intense anxiety, as well as adrenal and sleep problems due to going VLC for a few months. I’ve also had fibromyalgia for the past year now, and I could not get it to go away for the longest time. After reading Richard’s and Tim’s posts here, I added RS to my diet (which already included fermented foods, good meats, and lots of vegetables), and my symptoms have started to improve for the first time since I started feeling the pain. A note to anyone who may be reading this in hopes of helping their fibromyalgia- it took me a solid month of having dr bg.’s bionic RS and straight potato starch (total 8 TSP potato starch a day) to finally feel the pain subside, and I would guess it could take some people many months to get the same relief I got, depending on the state of their gut. So don’t give up if this doesn’t work within a month, and make sure to include the things that I consumed before I added the potato starch- dulse (for iodine), vitamin d and K supplements, as well as N-acetylcysteine , sauerkraut, kimchi, gochujang, variety of greens and other veggies, sweet potatoes and potatoes, magnesium and zinc supplements, prescription assist, and fish oil pills."